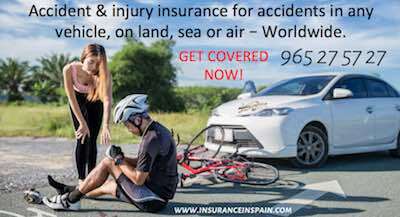 Accident & Injury Insurance in Spain to protect you against accidents and injuries for sports, at home or at work or whilst travelling in any form of public or private transport anywhere in the world. COVER FOR ACCIDENTS IN ANY VEHICLE BY LAND, SEA OR AIR, WORLDWIDE. www.insuranceinspain.com are pleased to announce that Liberty Seguros have launched a new Personal Accident & Injury Insurance Policy that covers you for personal accident and injury if you driving a car, scooter, or bicycle. With the ever-increasing number of fatal bicycle accidents on Spanish roads and the large amount of publicity it has generated, this policy is ideal for cyclists of any kind. For only 69.50€ a year, Liberty Seguros is offering to cover you in the event of an accident as the driver or a passenger in a car, scooter, motorbike, bicycle and motorised vehicles for up to 100,000€ and for 90.99€ a year you can increase this to 150,000€ of cover. 1. Cover if you are a passenger or driver of a vehicle. 2. Worldwide cover, even when you are on holiday. 3. If you are a pedestrian and are hit by any kind of vehicle. 4. Cover includes the use of any form of land, sea or air travel, including charter flights. 6. Permanent and partial disability. 7. Health care expenses caused by an accident.